Seattle, WA : YWAM, 1998. After flying in his big brother&apos;s airplane when he was only seven years old, Nate Saint spent his life flying planes to take missionaries to remote areas, ultimately landing on a beach in the jungle of Ecuador and losing his life in order to reach the Auca people. 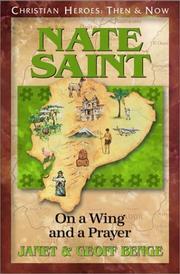 Nate Saint: On a Wing and a Prayer / Geoff Benge and Janet Benge. 520 Summary Etc. $a Summary, etc. note After flying in his big brother&apos;s airplane when he was only seven years old, Nate Saint spent his life flying planes to take missionaries to remote areas, ultimately landing on a beach in the jungle of Ecuador and losing his life in order to reach the Auca people.